The Lindsay Wildcats Major Bantam Girls enjoyed a very successful weekend! 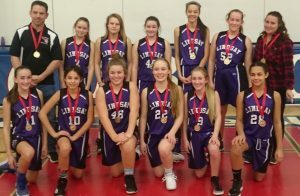 The team took on all comers, and then they took home the Gold, posting wins over Whitby, Toronto, Collingwood, and Mississauga, before taking Kingsville 32-25 in the final. WAY TO GO WILDCATS!!! I’m the brother of one of the Kingsville girls and I just wanted to congratulate you girls on your gold medal. You played hard and earned it, great game and good luck in the future! Thank you. It’s always great to have games where both teams compete hard, but fairly. Congratulations to your Kingsville team as well, and best of luck this year!